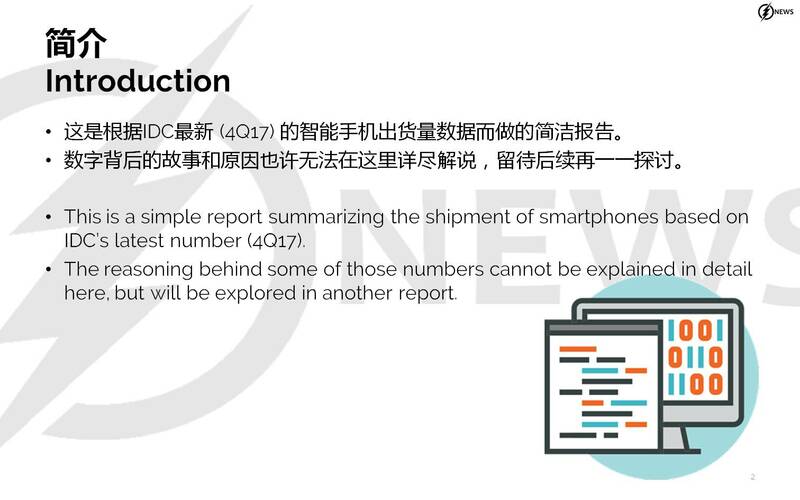 This is a simple report summarizing the shipment of smartphones based on IDC’s latest number (4Q17). The reasoning behind some of those numbers cannot be explained in detail here, but will be explored in another report. 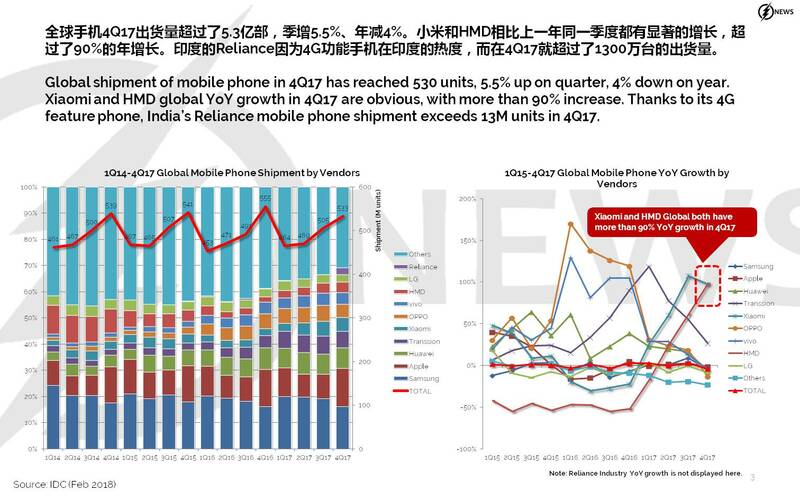 Global shipment of mobile phone in 4Q17 has reached 530 units, 5.5% up on quarter, 4% down on year. Xiaomi and HMD global YoY growth in 4Q17 are obvious, with more than 90% increase. Thanks to its 4G feature phone, India’s Reliance mobile phone shipment exceeds 13M units in 4Q17. Global shipment of smartphone in 4Q17 has reached 393M units, 4.3% up on quarter but down 8.5% on year. Apple exceeds Samsung with mere 1% gap of market share (Apple’s 20% and Samsung’s 19%) leading the market. China’s top 4, i.e., Huawei, OPPO, Xiaomi and vivo follows behind Samsung. 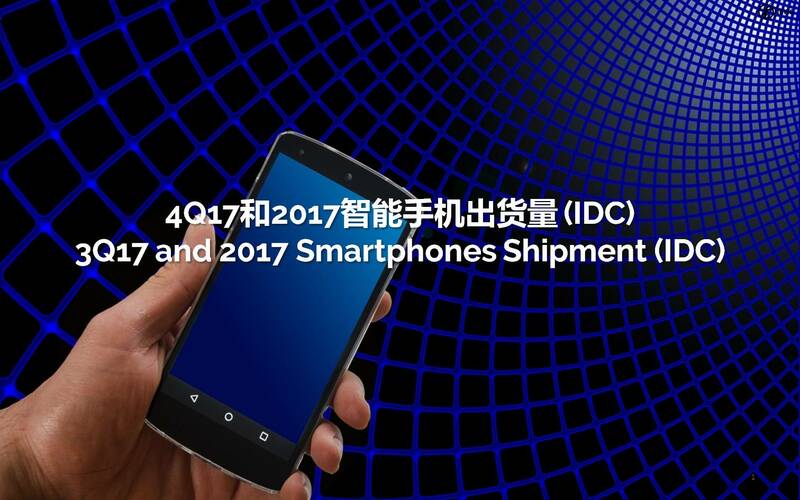 Xiaomi’s 4Q17 shipment, like 3Q17, has tremendous performance, with near double YoY growth. 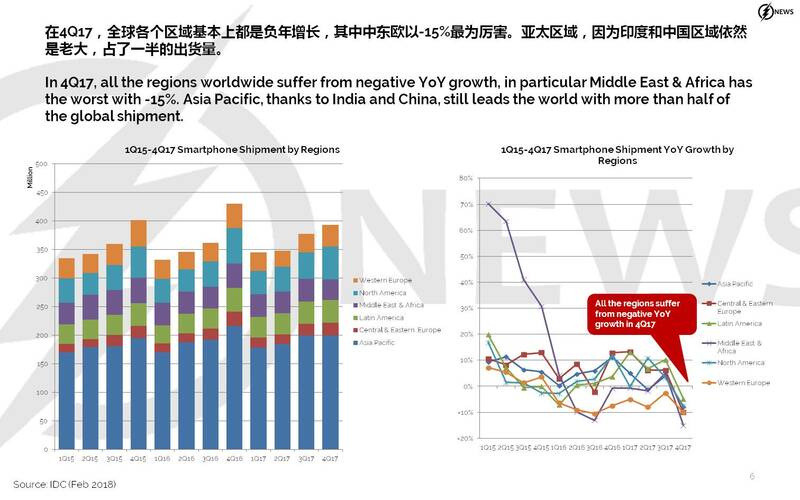 Global smartphone shipment in 2017 reaches 1.46B units, a 0.5% down on year, and this is the first time the smartphone market shows negative growth. Samsung leads the market with 22% share, follows by Apple with 15% share. However these 2 leaders YoY growth are below 3%. The smartphone value in 2017 is near US$460B, with Apple and Samsung together get near 60% (Apple’s 36% and Samsung’s near 24%). In 4Q17, all the regions worldwide suffer from negative YoY growth, in particular Middle East & Africa has the worst with -15%. Asia Pacific, thanks to India and China, still leads the world with more than half of the global shipment. In 4Q17, Samsung and Apple both share their success worldwide, with Apple reclaims its crown in WE (from Samsung) and APAC (from Huawei). Xiaomi should be happy with their 91% and 236% YoY growth in APAC and C&EE, respectively. 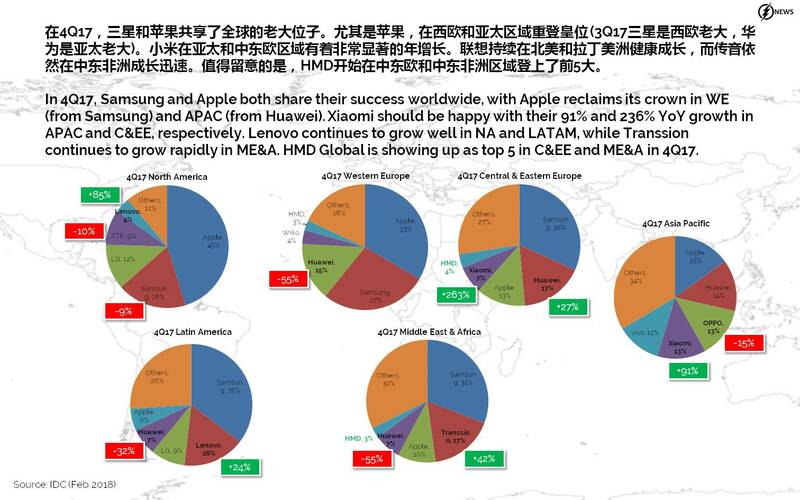 Lenovo continues to grow well in NA and LATAM, while Transsion continues to grow rapidly in ME&A. 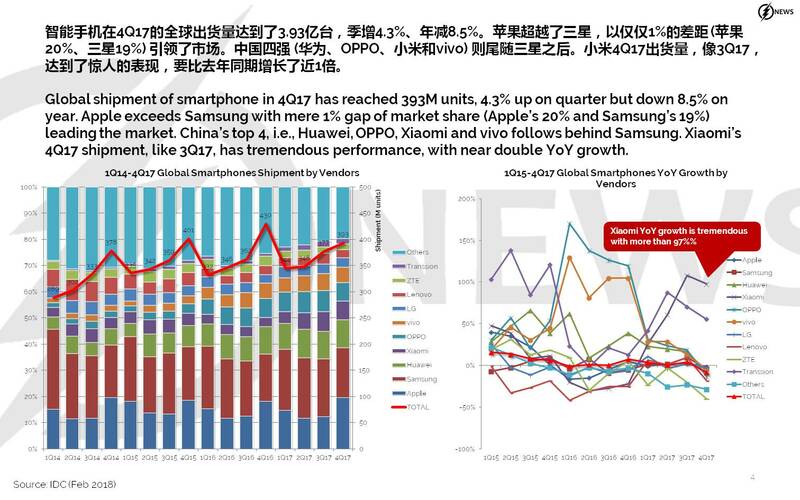 HMD Global is showing up as top 5 in C&EE and ME&A in 4Q17. 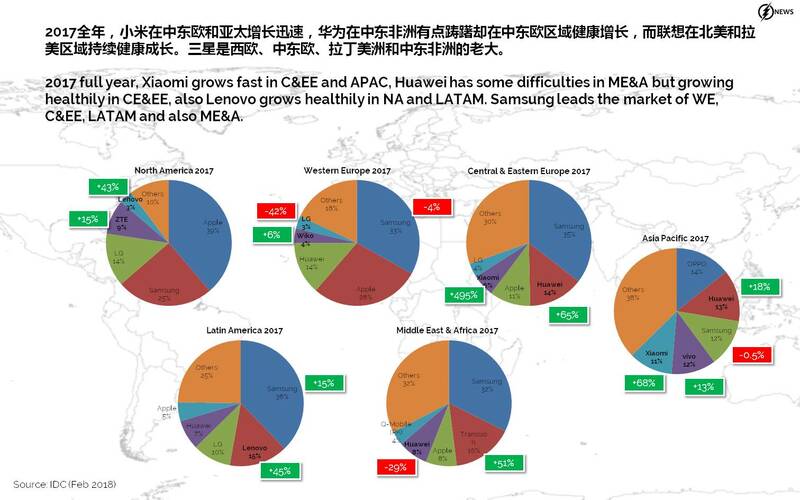 2017 full year, Xiaomi grows fast in C&EE and APAC, Huawei has some difficulties in ME&A but growing healthily in CE&EE, also Lenovo grows healthily in NA and LATAM. Samsung leads the market of WE, C&EE, LATAM and also ME&A. 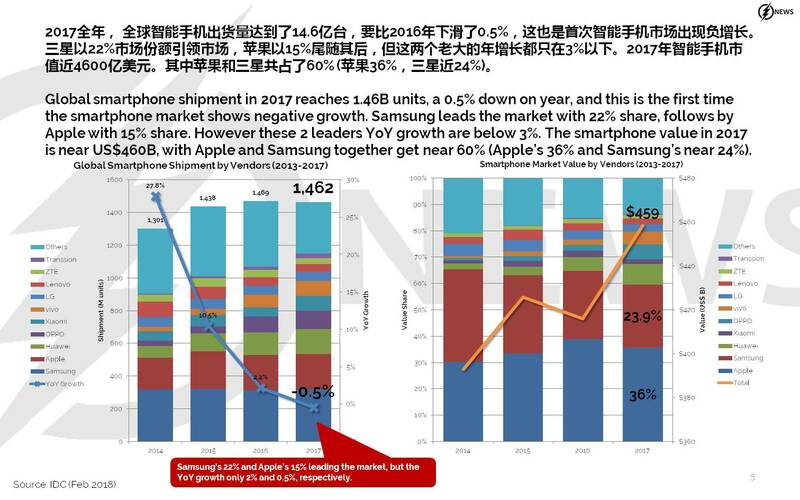 Smartphones with <US$200 still dominates the market with near 50% share in 2017 full year. Meanwhile, US$200-500 is growing to near 30%. Thanks to iPhone X, >US$500 share is also growing to near 20%. 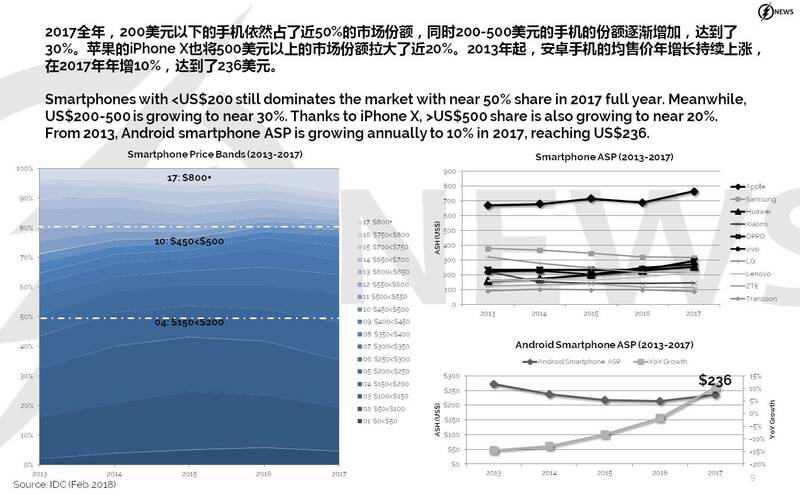 From 2013, Android smartphone ASP is growing annually to 10% in 2017, reaching US$236. 03-06: Samsung’s OLED factory utilization rate is estimated to now be at 50%~60%; Xiaomi plans to enter US market by end of 2018, or by early 2019; etc. → ← 03-02 MWC Week: Vendors and operators are touting their 5G development; A series of new phones are launched, with some featuring “notch display”; etc.